This luxurious 24 inch single sink vanity comes with your choice of a porcelain integrated or black vessel sink. Below, distressed cherry gives a sophisticated tone to the cabinet, which houses a single storage cabinet. Self-leveling feet add to the functionality of this fine piece. Fixtures are not included. I had been looking online for a small curved vanity for a tiny powder room for quite some time. The local big box stores did not have anything of quality. 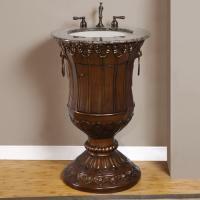 The Uniquie Vanities website and order process was simple and straightforward. The delivery process was without difficulties and arrived undamaged. I got several phone calls from the delivery company and it was seamless. Came when it was supposed to. Most of all the vanity is beautiful, furniture quality. Also, it is exactly as it was represented online if not better quality than I expected. The only assembly is installing the feet. Would buy again! !